Infusing spirits with botanicals such as juniper and pepperberry is all well and good, but have you ever tasted liquor fermented in an untanned cowhide? Alcohol enhanced with rattlesnake heads? Hooch distilled with the carcass of a wild coyote? Unless you've spent 12 months touring Mexico's dusty wild crazy mezcal regions, or visited the Sydney CBD's tiniest bar, I'm guessing the answer to all of the above is "no" and "come again?" Cantina OK! 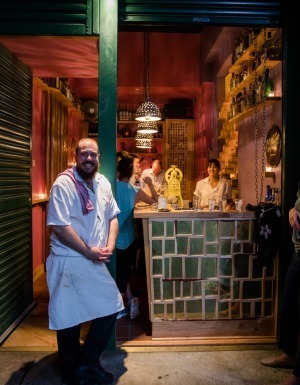 is a shipping container-sized mezcal bar hunkered off Clarence Street. There's room for 20 standing punters (no seats here, amigo) and the snack offering is limited to complimentary watermelon kicked with a chilli-spiked spice blend. Lilac walls, citrus fruits and a handsome canary yellow Nepalese ice-carving machine brighten an otherwise grey-on-grey laneway of no importance. The operation launched in late February and is very much a labour of mezcal love between co-owners Alex Dowd and Jeremy Blackmore (the blokes behind party bar Tio's Cerveceria in Surry Hills) and general manager Alex "Happy" Gilmour (also of Tio's), who is writing a thesis on agave spirit production for his master's in brewing and distilling. Briefly and generally, mezcal and tequila are both made by roasting, mashing, fermenting and distilling the "pina" (or heart) of intimidatingly spiky agave plants. Mezcal can be made from about 50 types of agave and each plant has a unique flavour profile. Tequila, however, can only be made using blue agave grown in designated regions of Mexico. Artisanal mezcal is hand-crafted using age-old techniques that require a significant amount of time and labour. 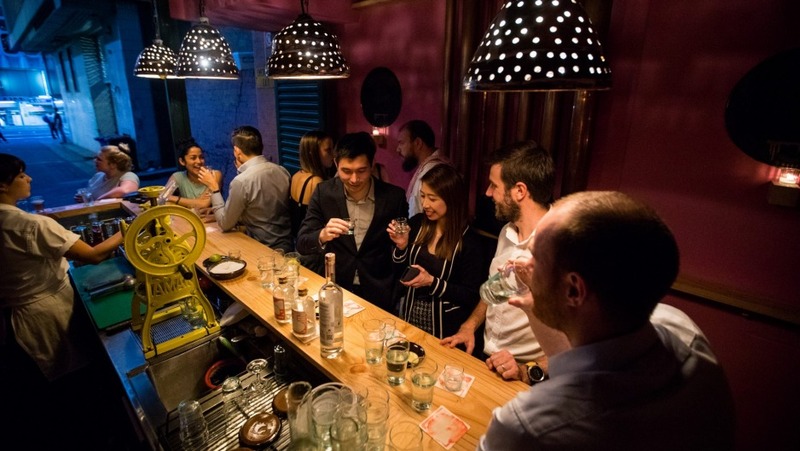 The Cantina crew have travelled Mexico extensively, meeting and drinking with small-batch agave distillers to bring rare expressions of mezcal and tales of its creation to Sydney. Throwing a dead coyote into an mezcal still might be the gnarliest thing I've ever heard of. "We met a guy in Michoacan named Jorge Perez, who is known for being a bit more experimental with his mezcal making," says Gilmour, who lived in Mexico for a year in 2010. "He was like 'Yeah, I've thrown some interesting stuff in the still such as coyote'. We asked, 'As in coyote the agave variety?' and he said, 'No, the animal' and just shrugged and made a pushing motion with his hands." "The guy had no teeth so I was liable to believe him," says Dowd. Pechuga is an officially recognised category of mezcal that includes anything distilled with additions such as pineapple, apples, plums, nuts, turkey, snake and, apparently, prairie wolves. The coyote pechuga is yours at $48 for 30ml while a similar Perez mezcal distilled with rattlesnake heads comes in at $44. These are super rare spirits, priced accordingly and designed to be sipped so you can experience all the earthy, floral, meaty, smoky, toasted majesty of agave-based booze. A 68-page guidebook is on hand to help navigate 48 examples of mezcal you'll be hard-pressed to find outside Mexico. Featuring 35-millimetre photography by Dowd, Blackmore worked with designer Clayton Ciolac for more than six months to bring the book to life. It's the most attractive drinks list I've seen in yonks, part zine and part travel diary with intel such as "Miahuatlan – one of the most famous mezcal towns. Each distillery is part of a complex home economy. See how many baby goats you can carry. The record is four." Ciolac has designed bespoke labels for Cantina's rare agave distillates, which share shelf space with more familiar mezcal, tequila and spirit brands. Staff have classic cocktail backgrounds and can sort you out with most standards, but what you really want is the Margarita OK! ($20) featuring tequila, mezcal and lime poured over shaved ice and charged with a burst of fresh orange peel oil. Delicious. Balanced. Highly smashable. There's a small selection of independent beers and top natural wine drops plus $11 nips of Alipus San Baltazar mezcal (still pretty good) if you're jonesing for shots, but plenty of other bars in the district provide the same or similar. 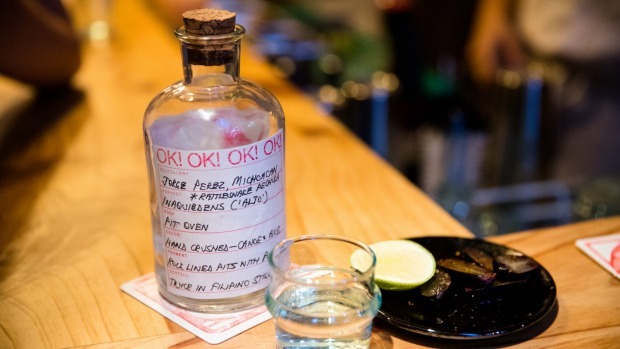 This is a place to invest time and fairly decent money (mercifully, the rare stuff is also sold by the half-pour) to experience mezcals ranging in flavour profiles that include dried squid, bushfires, lavender and rose. A place to hear stories of rope bridges and cartels and dusty drives in homemade sedans. A place to escape the city while still being in the thick of it.